The easiest way to get your first schedule into our system is to duplicate one of your previously scheduled weeks. Be sure you have entered your positions and set which positions each helper can help. You are then ready to enter your first schedule which can be the basis for future weeks. Your first schedule takes the longest to set up - once you have defined your shifts for the first week, you can then copy it into future weeks and make any necessary changes and use AutoFill to get the best help assignments for the new week. Optional: If many of your shifts have the same begin and end times (or lunch breaks or color, etc.) you can create Categories first so that you can choose them when adding shifts to quickly populate default fields as you add your initial shifts. 2. Add a Start and End Time for the shift - Enter time with 'a' or 'p' after it to indicate AM or PM. (Ex. 815a), or military time (Ex. 2215). You can enter any times you like down to the minute (the times can later be changed to reflect actual time helping if you like). 3. Duration - if the shift includes lunch or break time you can uncheck the Auto Calculate box and enter the duration for this shift. Make a mistake? If you need to change any shift, you can drag/drop it to another day or helper, or click the shift to change the times, position, or helper assigned or to delete it. Or you can use the Multi-Shift Edit view to make changes to more than one shift at a time. To copy a shift use Ctrl drag/drop. Note: After adding the shift(s), the window will close and your schedule is immediately updated without the page reloading. 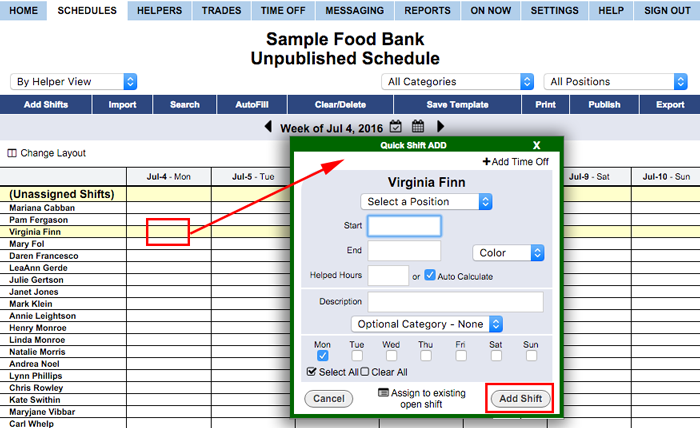 Optional Category - If you have shifts with similar begin and end times over multiple Positions, or if you have other reasons to use Categories, you can click the Category drop down and choose Add / Edit Categories to create Categories. (Ex. if you have similar night shifts for different positions, you can create a NIGHT Category and enter defaults so that when you Add Shifts, you can first choose that Category and the fields will be pre-populated - but changeable - for you in the Shift Change window). 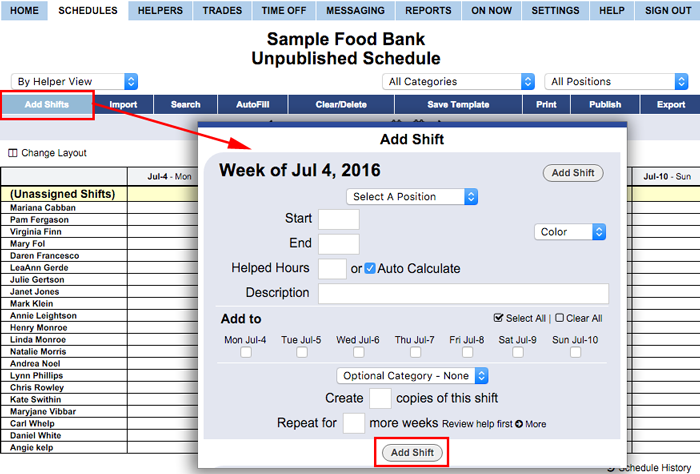 To add an "Unassigned shift" - Click the Add Shifts button at the top of the schedule (or click on a day in the highlighted unassigned shifts row at the top of the schedule) and leave the helper assigned set to "None - AutoFill". Note: You can have unassigned shifts automatically posted to the Tradeboard when you Publish so that helpers can pick them up.